A hot cup of coffee is one of the best ways to start a day for a lot of people in the world. However, you can't possibly enjoy your coffee if the cup or mug you're using doesn't offer you all the comfort you need. The suitable coffee cups and mugs are spill-resistant, light enough to carry around, washable, durable and easy to open. The list below shows some of the best coffee cups and mugs. Comparison Chart Of Pretty Best Coffee Cups And Mugs For Travel To Go!! When Pour in Hot Beverage, The Dinosaurs Transform Into Fossils!! BigMouth Funny Coffee Mug, this mug is in the shape of a ceramic toilet. The shape is its unique feature. It is usually sought out by coffee lovers who also want something fun and playful to drink from. The toilet shape will give you a big smile every time you pour your coffee into it. The Big Mouth coffee mug is perfect for people who think of coffee as their ‘medicine.' The mug's outer appearance is like that of a prescription pills container. It has a solid design that is neither too light nor too heavy. It can hold up to 12 ounces of coffee. The mug is full of interesting details, bright colors and funny writings. It is a coffee mug with a lot of personalities and a really cool style. While keeping your coffee hot, it is still able to stay cool so you can carry it around. It is a product of ICUP Inc. This one is a design inspired by the movie ‘Christmas vacation.' It is, therefore, suitable for the fans. It has a hollow and fragile neck and it holds about 4 oz of liquid despite its big size. This glass has a very beautiful look but is fragile and demands a lot of care. The design makes it well suited for display. You can use the mug in restaurants and bars or give it to a coffee lover as a present. Max'is Creation- The Mug With a Hoop, these mugs come with an attached hoop similar to that of a basketball. The hoop is for dipping your marshmallows into coffee, toppings into your ice cream and basically just whatever you want to. We especially recommend this to lovers of basketball. It is big enough that it can also be used as a bowl. Cleaning the mug is pretty simple because it is dishwasher and ceramic safe. The cup has a stainless steel handle as indicated in the name. It is a product of Bormioli Rocco Glass Company. This cup is a combination of tempered glass and stainless steel. The stainless steel is able to separate from the glass which makes it easy to hand clean. The tempered glass makes the cup great for hot drinks. The glasses are 3 ¾ inches tall and the package comes with 4 of them. The glasses have a beautiful and elegant look and the cups, being clear, make a presentation of whatever you're serving even more pleasant to the eye. The mug is a product of Gund and inspired by the popular webcomic Pusheen. The mug is great for cat lovers, fans of the Pusheen comic and coffee. It is a brand that has been there for over 100 years providing high-quality coffee mugs. The mug has really cute Pusheen graphics and a polka dot look with a ceramic body. It is about 13 cm in height holding up to 12 oz. the colors are also warm, homely and pleasant. The mug is made from high-quality materials making it durable. This 3dRose Best Wife Ever is a mug designed as a present for birthdays, anniversaries, Valentine's Day or just whenever you want to get a gift for the wife. It is a ceramic mug with the caption ‘best wife ever' on both sides. It is available in either 11 oz or 15 oz. The mug looks really good and the romantic print just makes it even better. It is a solid, fun and durable reminder of a husband's love to his wife. These mugs are a product of Elixir glassware. They are indeed true to the name. They are extra-large, holding up to 16 ounces, and double-walled. The glasses are great for maintaining drink temperature and still maintaining their coolness on the outside. These glasses are perfect if you want to enjoy your big cup of coffee or tea without having to worry about it getting cold before you are done or getting up for a refill. This is the Unemployed Philosopher's mug for Dr. Who and Sci-Fi fans. The Tardis appears to be sitting on an English street. When hot fluid is added into the mug, it disappears only to later reappear on the other side of the mug. (A faraway galaxy.) The mug is ceramic and it holds up to 12 ounces. Apart from the quality, this mug makes coffee or tea time so full of fun. Watching the Tardis appear and disappear is in itself such a worthy experience. These are coffee beer mugs from Avito. A package has two of them. They are double-walled which better equips them to maintain the temperature of your drink whether hot or cold. The outside remains cool to touch. They are made from 100% thick, good quality and durable stainless steel which makes them able to stand the test of time and easily washable. Without the lid, each mug stands at 4.5'' and can hold up to 14 oz. The handle is welded making it able to stay attached for a long time of use. This mug is a product of Le Creuset stoneware. The mugs have a protective layer of enamel that enables them to last longer. The outside is scratch and stain resistant. It is great because of its strength, good quality, durability, and lightness. The mugs are resistant to odor and flavor absorption making them versatile. They have a cool elegant look and hold up to 12 ounces. The interior is glazed so cleaning is easy. A package has two coffee mugs with lids. They are double-walled which enables them to maintain the temperature of your drink. This means that the mugs will keep your drink hot or cold. They are made of 100% stainless steel which makes them durable and easy to hand wash. Without the lid, each mug stands at 4.5'' and can hold up to 14 oz. The mugs have a larger capacity to hold a large cup of coffee or beer. These beautiful mugs are designed using healthy materials. They feature 100 percent food grade premium silicone and their lids are made with BPA-free materials making them healthy. These are heat-sensitive, color-changing mugs from The Unemployed Philosopher's Guild. When a hot liquid is poured into the mug, the dinosaur on it changes into fossils. This visual effect lasts for long after the mug is bought making it a really good choice. The mugs are large holding up to 12 oz and look really cool. It is a fun and cool way to enjoy your beverage especially if you are a fan of dinosaurs. The mug holds up to 12 ounces and the inside and outside are both curved. Apart from the hilarious look, the mug is really good quality. It keeps drinks cold for a long time. This mug is a perfect gift for anyone with a good sense of humor. It is, however, much more suited for display or as a novelty than actual drinking. This is because of the shape of its lip. These mugs are a product of Cupology. They are great if your mother lives in a different state. It is great for mothers' day and birthdays. The mugs are ceramic holding 11 oz and 15 oz.They are personalized depending on the states you are in. Hearts are placed in the different states you are in and connected with dots. These mugs come in pleasant, vibrant colors that do not fade even after a long time of use. The packaging is also beautiful making it ideal for gifting. This is a product of the unemployed philosopher Guild. It is a large mug printed with hilarious and witty insults from Shakespeare. The prints are made beautifully and neatly. For lovers of Shakespeare with a sense of humor, this mug is great. The insults are funny and will definitely cheer you up while you enjoy your drink. The packaging is also great making it a great gift. Are you looking for a quality the USA made a mug for coffee or tea? The Go Away Funny coffee mug is a great one that has a unique design. Got Me Tipsy is a perfect mug you can buy for valentines, wedding anniversaries or birthdays. This mug is made of high-quality modern glass. It has jokes and sarcastic sayings printed on the sides. It is perfect for lovers of tea or coffee with a sense of humor. It holds 13 oz of beverage and is a great gift for just about anyone. The packaging is also beautiful and great for gifting. The Joy Jolt Serene is a set of 2 thermal mugs. As the name indicates, they are double-walled. Each one of the mugs has a cool, unique curvature. These mugs are handmade and suitable for both hot and cold beverages. They maintain the temperature of your drink while still maintaining coolness. The borosilicate glass from which the mugs are made is unique because of its strength, durability. The mug can hold up to 7.4 ounces of beverage each. These mugs also offer you the optical illusion of your drink floating in the air. This makes the presentation of your drink very beautiful. This is a product of and is officially licensed by Warner Bros. studios. It is inspired by the movie Christmas Vacation. Each one of the mugs holds 4 oz and is packaged separately and the glass is very heavy. The mugs are very beautiful and festive and can, therefore, be used for both drinking and display. The box has pictures from the movie and it is therefore very beautiful and makes a great gift. This is a 100% recyclable stainless steel and natural bamboo mug with double walls and insulation. This makes it able to preserve the temperature of your drink. The lid, however, is made of plastic. It has two openings; a medium and small one. The design is non-breakable and the mug is super light. It is recyclable and eco-friendly and can hold up to 11 oz of your favorite beverage. The packaging can also be recycled. These mugs are especially suitable for children because they are completely free of toxins. This is a product of Big mouth Inc. As the name suggests, it is shaped like a donut with chocolate frostings. It is made from ceramic and holds up to 14 ounces of beverage. The mug is perfect for lovers of donuts because it is cute and looks like a real donut. It can be used not only for drinking but also for display and decor. Despite its shape, the mug is able to comfortably stand on its own. It is a really playful, fun and beautiful alternative to the basic, boring mugs especially if you don't mind small portions of your favorite beverage. This beautifully made mug has the best features of every coffee lover. This cup is made from pure steel which is clean healthy and has no added flavors. Has that rugged design that makes it perfect for outdoor adventure? The lid is easily removable with just flicking your thumb. Has rubber gasket sea that is insulating thus prevents spillage. The stainless steel won't rust therefore it is guaranteed to have that shimmering look for long. Anchor And Mill clear glass coffee mugs are made of high-quality borosilicate glass that is lead-free. The double-layered glass keeps your drink insulated whether it is hot or cold enough and is still comfortable enough to touch from the outside. Has this sophisticated looking glass that is super sleek. This mug is durable and perfect for everyday usage. The cup is dishwasher safe, microwave and the fridge too. They are very easy to clean with no previous drinks residue left. Has an individual gift box? This mug is what you would wish for like a coffee lover. The mug is microwave safe and dishwasher safe too, so you don't have to struggle hand washing it. The papa best cup comes with a label message on the back. It has a rim on top of the handle to give comfort-ability when taking your coffee. Made of durable porcelain and is hand painted. Just as it is called, it is inspired by Disney's chip from the movie beauty and the beast. You need to wash it before your first use thoroughly. Made from exquisite quality ceramics. It is sculptured and made with impeccable raised elements. Has angled rim on top of the handle for ease when taking your coffee. It is a beautifully indented chip on the side it just looks as cute as a chip. It is neither microwave nor dishwasher safe. The ceramic mug is detailed with raised features and includes the flaw that stirred its name. This cup has a pad that keeps your coffee at the right temperature. It is also very safe to carry in the wood. It has Mickey Mouse beautifully sculptured since it is Disney inspired. It has Mickey mouse features. It is perfect for placing on the office desk. Has a warming base that helps you keep your coffee at the right temperature so that you can enjoy your coffee better. The slight plastic smell is not temporary it sooner or later goes away. It might have melted residue if but you just need to hand wash it thoroughly. The mugs curved bottom does not affect the temperature of the coffee. This mugs prize is pocket-friendly so that you can get 1 for your whole family. There are a number of coffee mugs all of different sizes. If you are a big fan of coffee, then it makes sense to go for a large mug. It should, however, remain practical. It should also be able to keep your coffee hot or warm for long. If, on the other hand, you don't take a lot of coffee, choose a medium or small one. This greatly depends on your personal preference. Do you want a mug with or without a handle? It is important to note that if your mug is made of a material that conducts heat, then it definitely needs a handle. Consider the size of the handle to make sure it is comfortable for you. Some mugs have lids while others have none. Depending on your activity and where you take your coffee you may need a lid or not. A lid will protect your beverage from dirt. If you like to see your coffee while you drink it or just don't feel that it is exposed to any dirt, then a lidless mug is a good choice. Coffee cups and mugs can be made from ceramic, glass, porcelain, stainless steel or even aluminum. All of these materials have unique features. While steel is strong and durable, glass keeps your beverage hot for longer and does not retain smells. Who is the mug for? Are you buying a mug for a cartoon fan, a man, a mother or a wife? These days, the variety is endless. There are coffee mugs for just about anything. 01 What material for coffee mugs and cups are best for heat retention? 02 What is the importance of pre-heating coffee cup? - Many people love to preheat their coffee cups and mugs with hot water before porting the coffee. They do this because preheating prevents your coffee from getting cold fast. 03 Which is the best coffee cup with perfect insulation? - Coffee cups made of glass, ceramic retain heat well. But you can also go for paper Styrofoam and plastic cups. The compilation is meant to give you an easier time finding the best coffee mugs and cups for home to keep coffee hot. The right mug will help you to better enjoy your drink. We recommend the le Creuset stoneware 12-ounce mug, cassis because of its superior quality, style, material, and durability. The other coffee mugs also have unique properties that you may like better. 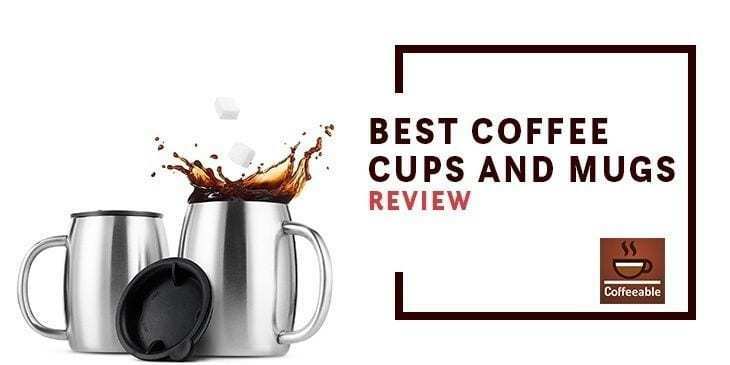 We recommend that you go through the entire review and find the coffee mug that works best for you.